Like many things, when it comes to assembling our tackle for the rigours of a day’s fishing there are some rights and wrongs. Often too, we’re in a hurry, especially when ... moretrout are rising nearby. In our haste it’s easy to overlook one or two of the fundamentals that lead to frustration and ultimately, disaster. 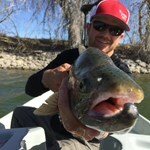 The basic guidelines outlined here will help beginners avoid unnecessary pitfalls and longer term should prevent potential damage or wear to fishing equipment. Smooth and polished, the brass ferrule fittings on old cane rods and the like could simply be pushed firmly together for a secure fit. Furthermore, being metal they were nigh on impossible to damage by hand, so even a forceful fit was rarely an issue. However, the female joint on carbon fibre or glass rods can be breached by hairline cracks if joints are rammed into position, so make a point of never pushing these rod sections together. Instead, when assembling modern day blanks, it’s better to misalign the rod joints by some 30-40 degrees and gently snug them into place by twisting until the guides/eyes align. As for dismantling rod sections, all that’s required is to twist the sections in the opposite direction while firmly easing then apart. It sounds and looks simple enough to fit a fly reel onto your rod. Generally speaking, you simply locate the foot of your reel into the openings and using the knurled ring, lock said reel in place. Why is it then that occasionally a reel drops off during mid cast, which is obviously worse if you’re afloat? Often, we rush and don’t completely lock the reel in place. Consequently, with the repeated action of casting, our so-called locking rings can work loose. It’s vital to secure the reel properly so no play is evident and if there’s an additional locking ring (as above), make sure this is firmly located too. Nothing appears more straightforward than actually stringing up a rod. Yet beginners are often confused by a number of things. Firstly, they assume a fly-line exits the reel spool from its uppermost edge to remain in line with the rod rings (picture 1). However, as we ultimately use the reel for line storage, such an arrangement causes the line to wrap around your hand or rod handle when casting or retrieving. Far better control is achieved when the line exits your reel from the spool’s lower surface (picture 2). Another common mistake sees beginners threading fly-line through the keeper ring near to the cork handle (picture 3). As seasoned rods know, this is there to accommodate our fly when moving from spot to spot (picture 4). Finally, as we often thread our rod up using the leader, often a rod ring can easily be missed with this invisible link, especially if we’re flustered due to hurrying because fish are rising. One surefire way of ensuring the rod is strung up properly is to double the end of your fly-line over as you’re now able to spot if any rings have inadvertently been bypassed, see main image (on page left). A question that always crops up is “how light or heavy should my reel drag be set”? Before discussing this, it’s as well to touch on reducing any drag on your reel between trips. This prolongs the life of mechanical parts in any reel’s braking system. Obviously, prior to fishing we now need to adjust the drag so it’s not in free run to prevent the spool repeatedly spinning, which in turn causes fly-line to ball up and tangle (left). Conversely, if you overtighten the drag, the chances are that your tippet will break when a trout charges off. Ideally, your drag should be tensioned so that – if you pull on line close to the reel – the spools turns freely enough without overrun occurring. Many prefer the loop-to-loop method of attaching leaders to fly-lines as this offers a degree of versatility by allowing changes from floating to sinking tapers. While this form of connection appears trouble-free, there is a correct and incorrect way of forming this link. The correct method is to pass the loop of your chosen leader over the fly-line loop before pulling the narrow end of your leader through the fly-line loop (right, top), which ensures the two loops are seated by interlocking them. By mistakenly passing the leader loop through rather than over the fly-line loop, a noose is formed (right, bottom) that can cause hinging and subsequent poor energy transition between fly-line and leader, resulting in poor turnover. When it comes to creating a leader, or adding tippet sections, several knots exist for joining lengths of monofilament to one another. One that remains reliable and is easy to master has to be the three-turn water knot (see below). Offer up two lengths of line that overlap by several inches. Note, if you prefer a longer dropper leg then take this into account by increasing this measurement. Using both these lengths of mono, form a loop. Pass the downstream ends (those in the direction of the fly/tippet end) through this loop three times before drawing tight. Remember to pull on all four ends to draw the knot up evenly. Having tightened, cut off both tag ends for a mono-to-mono connection. However, if a dropper leg is required, leave the tag end pointing towards the fly (downstream leg) long to act as your dropper. Frustratingly, dropper legs have a habit of wrapping themselves around the main leader to create a tangled mess. A simple overhand knot (see below) makes dropper legs stand at a definite right angle, which in turn goes some way to preventing unwanted tangles. Create your dropper leg using the three-turn water knot (see above). Throw an overhand loop around the main line and take the tag end through this opening. Dampen the knot and pull tight by tweaking the tag end forwards, towards the fly-line end to lock it in place. The dropper now stands at a right angle. For knotting on a fly perhaps the best known of all knots is the tucked blood knot (below). It’s vital not to take shortcuts here and make sure you include the extra tuck for a much more secure knot in all types of monofilament. Remember to take care when using fine tippets as this knot snugs down on the main line a fraction of an inch away from the hook eye and, when drawn tight, can cause an unsightly kink here that might even weaken your tippet. Pass loose end through the hook eye before twisting this round the main line four times. Double back tag end and take it through the opening between hook eye and the first twist of the knot. Now take the tag end through the large loop created when line was doubled backed. Moisten then draw tight by pulling on both the tag end and main line. Finally, snip away surplus end. For more information, go to my blog <a href="https://lifeundersky.com/">https://lifeundersky.com/</a>. SuperBowl Sunday Fran and Christian Allen, fly fishers from Massachusetts, joined me for a cloudy half day on Mosquito Lagoon. We spooked all the fish off the first spot. We just could not see them. The second spot produced a handful of seatrout, some of which were decent if not huge. Fortunately my anglers did not object to casting blindly. At the third spot Christian got a bite. His response? "That's not a seatrout!" He was correct, as a 26 inch red had taken the fly. It was a short, sweet trip, and that fish was the culmination. On Monday David Waring and his friends Ryan and Dan, all engineers from the Seattle area, joined me for some Mosquito Lagoon light tackle action. Redfish, seatrout, and black drum, all on either DOA CAL Shad or RipTide Sardines, came into the boat in spurts all day long. Dan posed with a couple of his fish! Tuesday I went scouting out of River Breeze. I did not find fish everywhere I looked, but I certainly found fish. The water is getting really low. Wednesday Coloradoan Donald Nunn joined me, again on Mosquito Lagoon. It was the slowest day of the week fishing-wise, but he still got several redfish and a couple nice trout, all on my favorite artificial baits (see above). Friday Billy Vail, a fly fisher from South Bend, and Billy Vail, a student in Jacksonville, joined me out of River Breeze. We got trout and reds more or less continuously all day, with the best fish coming on the last cast of the day. The fish was a lovely 27 inch seatrout. If I could script every day that's how it would play out. On Saturday Mic Lauric and his friend Brian, fly fishers from Atlanta, joined me for a day of kayak fishing out of a busy River Breeze Park. Somewhat inauspiciously I got the first two fish just a few minutes from the launch, a fine trout and a slot red, on a Polar Fibre Minnow. On the rest of the way to the spot I had in mind we saw very little. Even my spot was slow at first- all the fish were at the far end of it. Without the gruesome details, they had at least three doubles. Mic sent me the following email- "Thank you. Can't wait to do it again. Please send pics when you can. We want to braggggg..." Flies were synthetic minnow imitations. The fish were definitely on the feed. There goes that they don't bite good on the full moon nonsense. 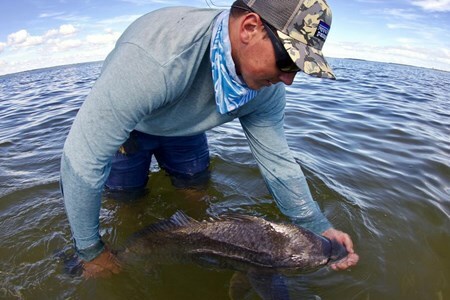 So, that is the still hot Mosquito Lagoon fishing report! All content in this blog, including writing and photos, copyright John Kumiski 2016. All rights are reserved. The week started last Saturday with a kayak fishing charter with Mic Lauric of Atlanta and his cousin Patrick, from Houston. The day began as a search mission, and the search paid off, especially for Patrick. He got numerous redfish and a couple nice trout too. Mic also got a few licks in. One was using the DOA CAL Shad, the other the Riptide Sardine. They seemed to work equally well. A cold front came through on Sunday. Monday morning found me at AutoNation Toyota with my brides car. They got me out early (just after 9 am!) so I went looking for shad in the St. Johns, launching at SR 50. A couple crappie, a fat bluegill, an anemic redbelly, a beautiful day and boat ride, but no shad. This year's shad run is shaping up pretty sadly for me. Tuesday morning was cold but sunny. I paddled (and dragged) a kayak to the place where Pat and Mic caught their fish. 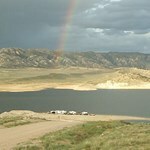 For fly fishers redfishing and seatrout fishing doesn't get much better than it was on Tuesday. 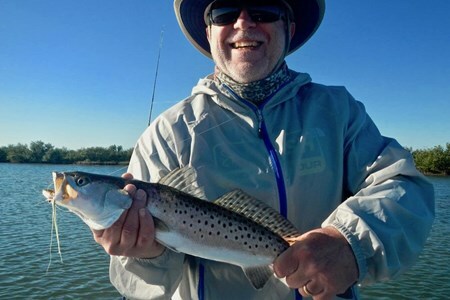 Sightfishing big seatrout with a flyrod is tremendous fun. They pull drag!!! Wednesday Steve Bartek and his buddy Vince, local gentlemen, joined me for some Mosquito Lagoon skiff fishing action. The weather was perfect, cool and sunny, almost windless. We found a spot with a lot of redfish and stayed there all day. Again, they were throwing the DOA CAL Shad and the Riptide Sardine. 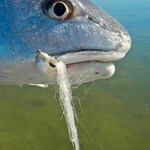 They seemed to work equally well, and they worked real well, about a dozen redfish worth not counting missed strikes. Thursday, another beautiful day, found Mr. Tom Finger of Oviedo, FL in the Mitzi, again on the Mosquito Lagoon. Needless to say we started at the hot spot from the previous day. It almost goes without saying that it was not nearly as hot. After Tom got a red (DOA CAL Shad) the rest of the fish first got lockjaw and then vacated the area. We went looking at a number of other spots, working hard but picking up several more redfish and trout too. At only one place did we not see any fish. Altogether a good day it was. Friday morning I went scouting for a Saturday bass fishing trip. Wasn't I surprised (not in a good way) when I could not get the Bang-O-Craft up the Econ. The water is too low. My decision to check Lake Harney was foiled by the same problem- shoaling and low water prevented me from reaching the lake, too. I put the boat on the trailer, drove it home, dropped it off, threw a kayak on the van's roof, and went to the Econ. The water is low and clear, just gorgeous. For our friends in colder climes, the willow trees are leafed out and flowering, as are the red maples. With the quality of light now the river is Clyde Butcher picturesque. Three hours later the kayak was returned to the van's roof. I did not touch a fish in either place, yes, slapped upside the head by the dreaded skunk. Loved every moment of it. 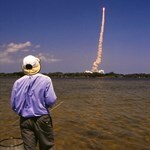 So, that is the hot Mosquito Lagoon fishing report! Sunday found me in a canoe with Mr. Roger Cook, gentleman and fly fisher from North Carolina. On a spectacular day we were looking for tailing black drum, a fish and behavior that had been plentiful the previous week. We ran into another fly fisher, a young man named Nick Swain, who was out on a paddle board. He found some drum, not tailing, and caught one while we watched. I photographed him. He invited us to cast to the fish he was working, but we could not get a bite. Monday Tammy and I Bang-O-Crafted our way up to Puzzle Lake, searching for American shad. We caught some crappie. We caught some sunfish. But we did not get any shad. We ran into a couple other folks who had caught a few. One fly fisher called them "the fish of a thousand casts." Shad should not take 1000 casts. When they're around you often catch two at a time if you use a tandem rig. There just aren't many in the stretch between SR 46 and Puzzle Lake. Will they show? That's the question. Wednesday I took the Mitzi across Lake Harney and fished the outlet, again for shad. Using crappie jigs I got three, nice ones all. It was still pretty slow. Going upriver I tried again at the mouth of the Econ. I got two warmouth, nothing else. That was really slow! 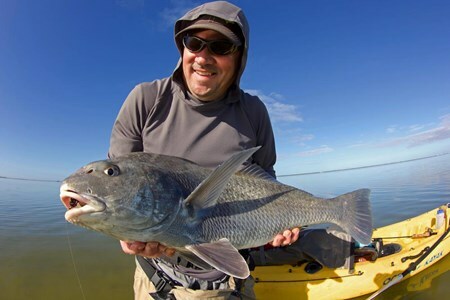 Thursday Roger Cook and I went looking for tailing black drum again. 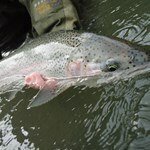 Although we saw a half-dozen or so, most of the fish were still schooled up in deeper water. Roger managed to get one of those fish to eat a fat brown sparkle crab. I could not get a bite, and ended up fishless at the end of another long, tough day. Roger and I went out on Mosquito Lagoon on Friday. We used fly tackle, and got spanked. We saw some fish, but it was windy, and the water is getting dirty again. DANG! We got exactly one decent shot, which we did not convert. Did the wind stir goo off the bottom into suspension, or are the algae already growing again? Hopefully it's only the former. Time will tell. 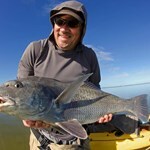 So even though almost all the fish were elusive this week, that is the elusive black drum fishing report. 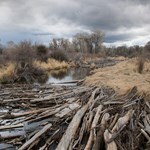 A cold front slammed us last weekend, cold, wind, rain, the whole she-bang. Monday afternoon the weather started to moderate, so I took the kayak to the St. Johns on a shad mission. It was slow, but in three hours I got two shad (one on a chartreuse shad fly and one on a pink crappie jig), a couple crappie, and a redbelly. There were hardly any airboats, a lovely afternoon all together. With charters coming up I went to the Mosquito Lagoon on Tuesday for some scouting. Wasn't I surprised- the water was pretty clean in places! The bad news is lots of the seagrass is gone. Hopefully the water will stay clean and the grass will come back. With clean water I could sight fish. 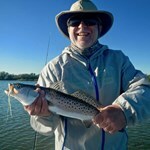 The seatrout were sunning in a lot of my favorite spots, nice fish in the 20-inch-plus range. Redfish were also ranging on the flats. My current favorite lure, the three inch DOA CAL shad, was effective on both. I felt pretty optimistic about my trip the next day. Wednesday Brent Chapeldaine and Tom Howell joined me for Mosquito Lagoon fishing. 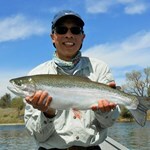 Out of the gate we hit trout, on the three inch DOA CAL shad. No surprise there. The larger fish had scattered some, but there were enough around that they kept three handsome fish. They also got quite a few redfish to about 24 inches. Basically we caught fish all day, a splended outing. Thank you for joining me, gentlemen! Thursday was a Banana River Lagoon trip, with fly fishers Kevin Barnes, from Georgia, and his friend Jamie, from Pennsylvania. The word younger folks would use to describe the fishing is "epic." Tailing fish most of the day, calm winds, drizzly but not uncomfortably so, and the whole place to ourselves. Wool crabs worked well. Thank you gentlemen for the second awesome day this week! 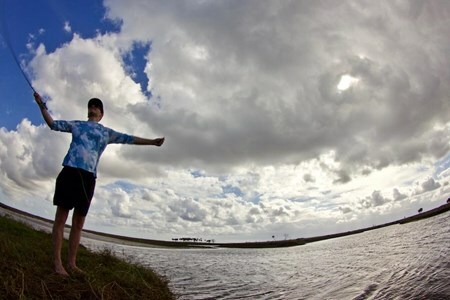 Friday my old friend Kevin Linehan joined me for some fishing on Mosquito Lagoon. I wanted three trout in the 17-18 inch range for dinner, two for me and one for him. We caught a load of trout but did not complete the task, with one sixteen inch fish for Kevin and zero for me. Saw an honest-to-goodness school of redfish, at least 50 fish. They weren't happy, but it was the largest school I've seen in a couple years, a wonderful thing. So we have clean water, sight fishing, a school of fish, good catches, some good news for a good news lagoons Fishing Report! Mixed Bag New Year's Orlando Fishing Report We fished the Mosquito Lagoon one day, and the St. Johns River two days, and the Banana River Lagoon one day. Of course results were a mixed ... morebag. And Sunday is New Year's Day! So we have a mixed bag New Year's Orlando fishing report! Best wishes to all for a happy, healthy, and prosperous 2017! Monday around noon I went launched the Bang-O-Craft on the St. Johns. Son Alex and John Napolitano were with me. It was warm and sunny and every airboat in Florida seemed to be there. Fish were popping fry minnows all over the river. At the mouth of the Econ there was a paddling fly caster who steadily caught 12 inch bass on a small white streamer. Since there were three of us we refrained from joining him and went farther up the Econ. We found breaking fish up there but they weren't taking our flies very well. John and I each got a crappie. We went back down the river and the other angler had left. We took his spot. Fish were breaking steadily. Using a fry fly I did some damage! Bluegills, bass, and my first shad of this season all succumbed to the fry fly's charms. 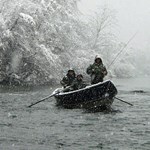 When the action slowed we went down the river, where we found another spot with breaking fish. Again, the fry fly did some damage, taking some reasonably large bass. The other fly that worked extremely well was a #10 white Gurgler, a silly little fly. The fish liked it, though! Start the thread. Cut off a clump of craft fur and pick out most of the fluff. Tie it on to the hook, smooth the head, and whip finish. Glue the eyes on with Zap a Dap a Goo or Duco cement. After the glue dries, coat the head with Softex. Since the fly is small, you'll catch some very small fish with it. Some surprisingly large fish will take it, too. The hook is on 3x thick wire, so it will hold a good fish without issues. 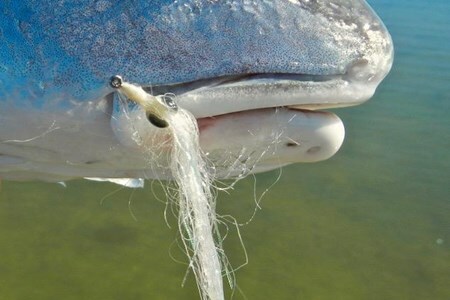 You can see how to tie a gurgler here http://www.spottedtail.com/how-to-tie-a-gurgler/. Since the #10 is so small I use hackle fibers for the tail and the tying thread for the body- simple! 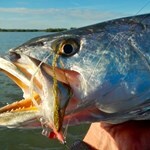 On Tuesday Greg Scible and Caleb Cousins joined me for some Mosquito Lagoon light tackle action. 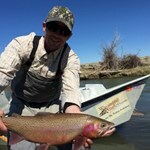 Unfortunately the action part was fairly slow- a couple trout and small reds. We started fishing the spots that had been so good to me last week- not so good this day. We tried Deadly Combo-ing for trout. We got a few fish but again, pretty slow. 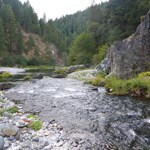 We checked out a couple spots where I had found fish last week. Caleb got a slot red on a DOA CAL Shad. We Deadly Comboed again and got a few short trout. We tried soaking cut mullet in two spots where this worked wonderfully last week. Not even a catfish this day. I cranked the motor to move, and it pooped out. It would not start again. I had them start fishing while I thought about the problem. They started hitting trout immediately, again on the Deadly Combo. Most were short, but a few were slot fish. In the meantime I checked the in-line fuel filter. It looked fine, but there must have been some debris in it. When I reassembled it, the boat ran fine. We kept fishing though, and got a bunch more trout. We ended the day with six reds and about 30 trout, not bad for a slow day. Wednesday at 8 AM I met Paul MacInnis at the Space Center Badging Station. He got me a visitor's badge and off we went to the Banana River Lagoon. We had perfect paddling weather- no wind, no clouds. We paddled a long way before we found any fish, though. 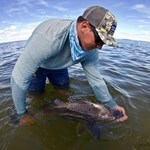 The fish we found was a school of large black drum. They were way more interested in each other than in our flies, as we did not get bit. We got a few small trout, though. We found some smaller drum. I got one about seven pounds or so on a crab pattern. I later got a small, beautiful nine-spot redfish on the same fly. Paul got a fish here and there too. Some kind of rooted vegetation is beginning to grow on the otherwise barren sand bottom there, and the water is quite clear in most places. Perhaps it was just an off day, but it was pretty slow fishing-wise. Thursday afternoon I went back to the St. Johns, by myself, by kayak. A short distance from the boat ramp there were breaking fish. My first two casts, on the little gurgler, each garnered strikes from 12 inch largemouths. Before leaving that spot three strikes were missed and two more bass released. The spots that had been so hot on Monday were not on Thursday. Apparently the fish are following the moving bait. No shad or crappie were caught, but bluegills and a couple more bass rounded out the catch. All fish were released to make more fish for the future. Thursday night a cold front came through, putting the kabosh on any thoughts of fishing Friday. So that is the Mixed Bag New Years Orlando Fishing Report! Have a great holiday! !